Today, eddy covariance measurements of carbon dioxide and water vapor exchange are being made routinely on all continents. The flux measurement sites are linked across a confederation of regional networks in North, Central and South America, Europe, Asia, Africa, and Australia, in a global network, called FLUXNET. 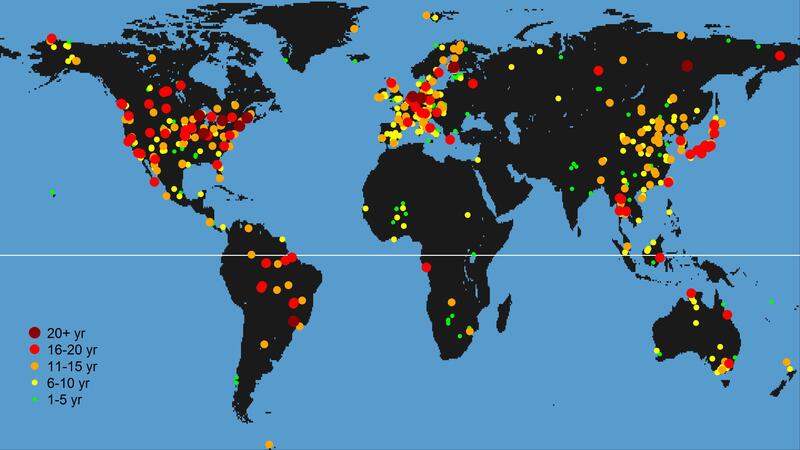 This global network includes more than eight hundred active and historic flux measurement sites, dispersed across most of the world’s climate space and representative biomes. the FLUXNET-Fluxdata website (https://fluxnet.fluxdata.org/), hosted at the Lawrence Berkeley National Laboratory (USA). Here the data that have been shared by the Regional Networks and processed and harmonized to share with the FLUXNET communities. Fluxdata website offers a number of tools in addition to the data access such communication and ideas sharing platforms, documentation, and support to the FLUXNET data users. The FLUXNET2015 dataset is the first new global FLUXNET dataset since the LaThuile dataset in 2007. The team involved in preparing the data are spread across the towers and regional networks that contributed data as well as UC Berkeley (Housen Chu and Dennis Baldocchi), University of Tuscia (Dario Papale and Carlo Trotta), University of Virginia (Marty Humphrey and Norm Beekwilder), and Berkeley Lab. The DST personnel on the team are Gilberto Pastorello (data processing and preparation), Megha Sandesh (FLUXNET data portal), You-Wei Cheah (metadata and data preparation), and Deb Agarwal (data lead). Image credit - Housen Chu, UC Berkeley. OpenMSI is the most advanced tool for analyzing and visualizing mass spectrometry instruments (MSI) data that is available via web-browser. MSI technology enables scientists to study tissues, cell cultures, and bacterial colonies in unprecedented detail at the molecular level. Nowadays, MSI datasets range from tens of gigabytes to several terabytes. Thus, basic tasks like opening a file or plotting spectra and ion images become insurmountable challenges. OpenMSI overcomes these obstacles by making highly optimized computing technologies available via a user-friendly interface. Because OpenMSI leverages NERSC resources to process, analyze, store, and serve massive MSI datasets, users can now work on their data at full-resolution and in real-time without any special hardware or software. They can also access their data on any device with an internet connection. Ben Bowen of the Environmental Genomics and Systems Biology Division and Oliver Ruebel of the Computational Research Division led the development of the technology. Several other DST and NERSC personnel were involved in the development of this technology. Sean Peisert chaired a second ASCR-sponsored workshop on the subject of cybersecurity research for scientific computing integrity in June 2015. The goal of this workshop was to define a long-term 10 to 20 year fundamental basic research and development strategy and roadmap regarding scientific computing integrity facing future high performance computing (HPC) and scientific user facilitates. 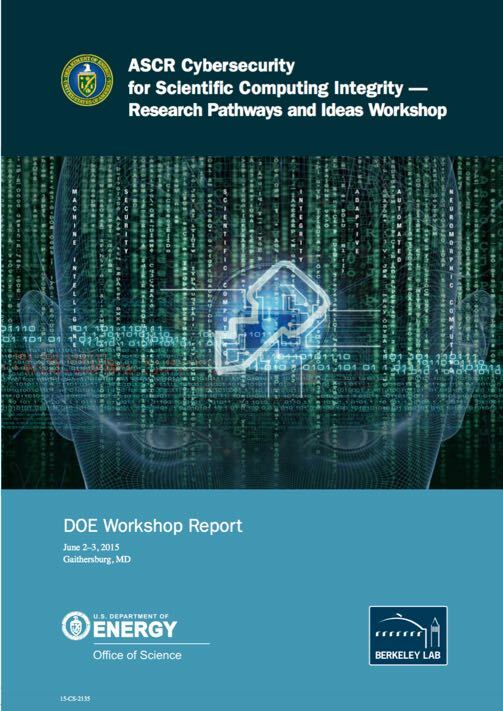 This report builds on the findings of a previous ASCR Cybersecurity workshop, to examine computer security research gaps and approaches for assuring scientific computing integrity specific to the mission of the DOE Office of Science. Subsequently, Peisert also compiled and edited the resulting workshop report. Shreyas Cholia is not just another software engineer. 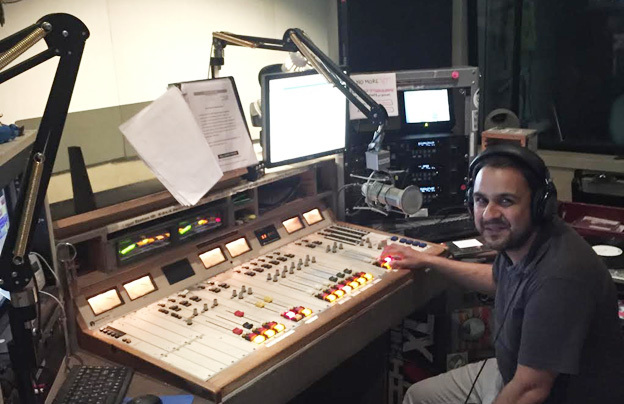 If you've tuned into KALX lately, UC Berkeley's radio station, you may just have been enjoying the DJ sensibilities of DST's own Shreyas Cholia, a computational systems engineer who works jointly for CRD and NERSC. Cholia started as a volunteer at KALX in 2003, a year after joining the Lab, looking for a way to channel his love of music into an interesting extracurricular activity. Twelve years later, he's hosting his own KALX show every other Tuesday night. Read more in the recent article in Today at Berkeley Lab. Dani Ushizima of the Data Science and Technology Department has received a 2015 Early Career Research Program award from the Department of Energy's Office of Science. The award will fund research into developing new methods to help scientists extract more information from digital images produced by experiments studying materials such as ceramics and geological samples at the Department of Energy (DOE) facilities. The work is important as facilities are deploying instruments that can produce digital images at much greater resolution and much more frequently than just a few years ago. 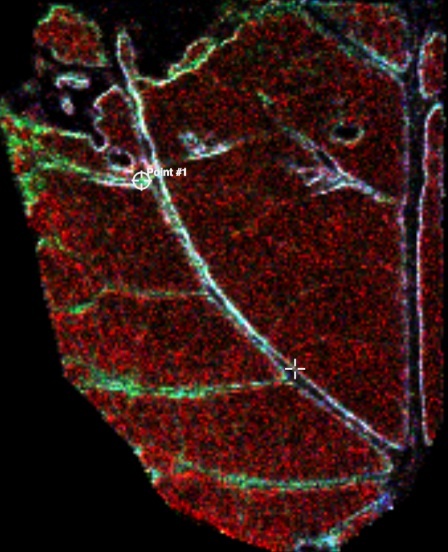 Images are being generated so quickly that scientists are struggling to keep up and extract information contained in this data modality... Read more in the recent article on The Computational Research Division website. Sean Peisert is serving as general chair of the 36th IEEE Symposium on Security and Privacy, May 18–20, 2015 in San Jose, California. Since 1980, the IEEE Symposium on Security and Privacy has been the premier forum for presenting developments in computer security and electronic privacy, and for bringing together researchers and practitioners in the field. This year's program committee has selected 55 research papers covering a wide range of topics. An estimated 500 attendees from around the world are expected. As in past years, there will be a poster session, a short talks session, and several workshops that will take place alongside the symposium, including workshops on privacy engineering, genomic security and privacy, language theoretic security, mobile security, and Web 2.0 security and privacy. Also at the symposium is a NITRD panel, featuring panelists from NSF, DHS S&T and other government agencies involved in creating the 2015 Federal Cybersecurity R&D Strategic Plan, as well as several "Birds of a Feather" sessions including discussions on network integrity, the Federal Cybersecurity plan and privacy in affective computing. Sean Peisert chaired an ASCR-sponsored workshop on the subject of cybersecurity research for scientific computing integrity, a key interest of the DOE Office of Science, ASCR in particular. Subsequently, He also compiled and edited the resulting workshop report. Alexy Agronovsky of UCD was the lead author on the paper "Improved Post Hoc Flow Analysis Via Lagrangian Representations" which won Best Paper Award at the IEEE Visualization Large Data Analysis and Visualization Symposium. The basic idea is that flow field analysis can be done more accurately using a Lagrangian basis rather than an Eulerian basis, and that the work needed to produce the Lagrangian analysis can be done in situ, which results in not only better (more accurate) analysis but also at much less I/O cost. Hank Childs of DST led the team. Additional contributors to the paper are David Camp, Christoph Garth, E. Wes Bethel, and Kenneth I. Joy. The Inria Research Center in Rennes, France has awarded Deb Agarwal an International Chair position. This position is a part of the DALHIS Associated Team which is a collaboration between Dr. Christine Morin’s Inria Myriads team and the Data Science and Technology Department. The Data Science and Technology Department was announced today. 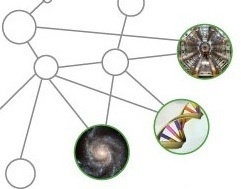 This department brings together groups working across the span of data science problems. The new department is made up of the iintegrated Data Frameworks group led by Dan Gunter, the Scientific Data Management group led by John Wu, the Data Analytics and Visualization group led by Wes Bethel, the Usable Software systems group led by Lavanya Ramakrishnan. These groups have a long history of research and development in data science. This reorganization better aligns the groups to work together to address problems holistically. The Computational Science Department, formed at the same time, is composed of the groups focused more on a particular science and includes Craig Tull's Science Software Systems group. More details about the reorganization can be found here. Women from Berkeley Lab's Computing Sciences area and DST delivered talks, volunteered as mentors and helped organize and energize this year's Grace Hopper Celebration of Women in Computing. More details available here. NPR's Science Friday notes NERSC, ESnet, CRD, SLAC collaboration that uses the SPOT Suite developed by DST researchers. This was based on observations of interesting science that was submitted by listeners. More details available here. The Berkeley Institute for Data Science has introduced its senior fellows, including Lab researchers Deborah Agarwal, E. Wes Bethel, Peter Nugent, Saul Perlmutter, David Schlegel, James Sethian, Kimmen Sjolander, Kyle Barbary, Beth Reid, and David Culler. The funded science fellows were also named with Daniela Ushizima receiving the only award to an LBL researcher (congratulations Dani!). Go here to view the complete list. Today, the tools available to the scientific community are undergoing a major revolution with a wide range of innovations that are enabling powerful new capabilities for knowledge discovery and analytics. The majority of these innovations are being motivated by major large scale science research initiatives. The foundation for these innovations consists of multiple new information technology architectures, tools, techniques and platforms. Berkeley Lab's Computational Research Division (CRD) and Univ. of California's AMPLab hosted a weeklong workshop on big data analytics from June 2-6. This year, the workshop covered a wide range of topics including machine learning, graph processing, data security, tools for big data analytics. "The workshop was very successful and allowed the participants to both understand the general landscape but also dive-in deep with hands-on tutorials. The key to success of the workshop was the expertise at Berkeley Lab in these areas," said organizer Lavanya Ramakrishnan of CRD's Advanced Computing for Science Department. In addition to Berkeley Lab and UC Berkeley, the speakers were from Cloudera, Apple, Cisco, Yahoo!, UC Davis, Nebula Inc, Microsoft, Google, HP Labs, Adatao, Databricks, Hortonworks and Amazon. Eugen Feller has spent the last year visiting LBNL as an Inria@SiliconValley Post-doc as part of the DST Department/Inria Associated Team DALHIS. During his time at LBNL Eugen contributed to several research projects including Frieda and AmeriFlux. To read more about Eugen's experiences, see the interview he did once back at Inria. Taghrid Samak of Berkeley Lab's Computational Research Division admits with a laugh that she wasn't one of those kids who started programming on the home computer at age 10. And if she hadn't followed her father's advice, she might have ended up looking for political solutions to pressing problems, rather than working on computational approaches to scientific challenges. Read more. DST intern Amy Nesky presented a poster on the work she did for the Baryon Oscillation Spectroscopic Survery (BOSS) at the Fall SULI poster session. Amy's work involved designing and developing an interactive, visual analytics website to help track and analyze the progress of the survey. See the poster for more details. DST's Craig Tull was recently featured in an article for DEIXIS Magazine. The project is an LDRD involving CRD, NERSC, ALS, and ESnet personnel. DST personnel involved in the project include Craig Tull (project lead), Abdelilah Essiari, and Lavanya Ramakrishnan. LBNL's Kristin Persson recently co-authored an article for Scientific American about the Materials Project. The project here at LBNL involves personnel from many divisions across the lab. DST personnel involved in the project include Dan Gunter and Miriam Brafman. On October 18, participants and mentors from the TechWomen program visited LBNL for a tour of its facilities, including the Advanced Light Source. After the tour, DST department head Deb Agarwal gave a presentation on how to be an exceptional leader. The visit was organized by DST's Taghrid Samak. 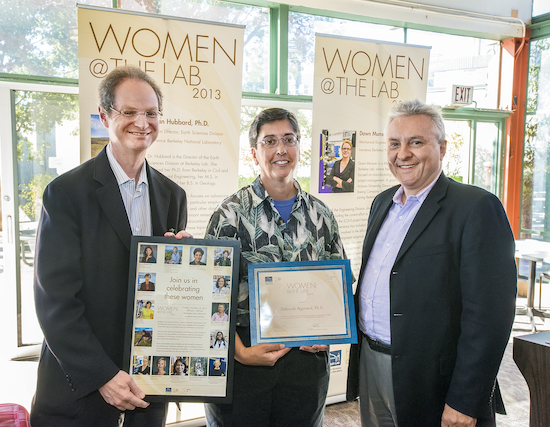 Deborah Agarwal, head of CRD's Advanced Computing for Science Department, was among 15 women honored October 18 during the first annual Women@The Lab event. Sponsored by the lab's Diversity and Inclusion Office and the Women Scientists and Engineers Council, the event highlighted the women's contributions to science and technology as well as the lab's commitment to diversity and its support for the Science, Technology, Engineering and Mathematics (STEM) workforce. As the summer starts to wind toward a new school year, we want to acknowledge the excellent work of our summer students. Here is a list of this year's summer's students and a brief title for what they worked on while they were here. Tonglin Li, from Illinois Institute of Technology, Chicago. FRIEDA state management in cloud environments. Zhao Zhang, University of Chicago. Next-generation infrastructure support for mixed workloads. Morgan Hargrove, Louisiana State University - Materials Project workflow interface. Ryan Rodriguez, University of California Santa Cruz. Tigres visual representation of workflows. Ahmed el Hassany, Indiana University. Interoperability between ESnet lookup service and IU's lookup/topology service (UNIS) to avoid fragmentation of perfSONAR landscape going forward (Joint with Esnet). Karlyn Harrod, University of St. Thomas. Energy consumption models for distributed systems. Jin Huang, University of Texas at Arlington. Machine learning for modeling network utilization. Twenty years ago, researchers began installing sensors in a variety of ecosystems to study how carbon dioxide, energy and water vapor cycles through the environment. Today, these sensors have been deployed at 120 locations across the Americas. Because the Department of Energy recognizes that these datasets could benefit a variety of scientific communities, it is funding an effort to make this data accessible to a wide-range of researchers. Margaret Torn of Earth Sciences Division will be leading this effort and will be working closely with ACS member Deb Agarwal. See the full article here. Once again, ACS staff contribute their expertise and experience at the SC12 conference. SC12 will be held Nov 10-16 in Salt Lake City, Utah. Taghrid Samak, Dan Gunter and Zhong Wang. Prediction of Protein Solubility in E. coli. Elif Dede, Zacharia Fadika, Jessica Hartog, Madhusudhan Govindaraju, Lavanya Ramakrishnan, Dan Gunter and Richard Shane Canon. MARISSA: MApReduce Implementation for Streaming Science Applications. The ACS Department recently received funding for work on two collaboratories research projects. Tigres: Template Interfaces for Agile Parallel Data-Intensive Science. This project is addressing the challenge of enabling collaborative analysis of DOE Science data through a new concept of reusable "templates" that enable scientists to easily compose, run, and manage collaborative computational tasks. These templates define common computation patterns used in analyzing a dataset. more. . .
FRIEDA: Flexible Robust Intelligent Elastic Data Management. This project investigates an infrastructure strategy that seeks to combine the different usage modalities present in DOE communities under one model that encourages collaborative sharing, supports community growth, accommodates emergent usage patterns such as on-demand computing, and lowers the entry barrier to the use of DOE facilities from desktop to exascale. This project is joint with Argonne National Laboratory. more. 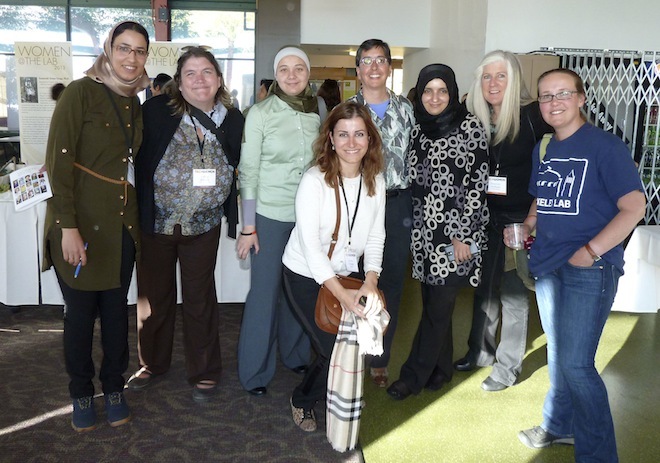 . .
Berkeley lab is once again participating in the TechWomen program. Three emerging leaders from the Middle East and North Africa are visiting the lab for three weeks to work with science mentors at the Advanced Light Source, in Physics, and in Computer Science. TechWomen is an initiative of the U.S. Department of State and matches professionals in the U.S. with counterparts in the program for mentorship and exchange. All forty emerging leaders participating in the program will visit NERSC during the program to learn about high-performance computing and get a tour of the facility. They will also hear talks and interact with a panel of women computer scientists at Berkeley Laboratory. This year, a number of topics including DOE's Co-Design centers, GPU programming, compiler frameworks, energy efficiency, NoSQL databases and Hadoop were covered. "The workshop was very successful and helped the attendees understand the technologies in depth and separate hype from reality. The expertise at Berkeley Lab in these areas was critical in putting together the content for this workshop," said organizer Lavanya Ramakrishnan of CRD's Advanced Computing for Science Department. In addition to Berkeley Lab, speakers were from Lawrence Livemore National Lab, UC Berkeley, Intel, Sandia National Lab, Cloudera, Hypertable, Mellanox, IBM Research, Instagram, 10gen, Paradigm4, Yahoo!, Netflix, VMWare, Hewlett Packard. Participation was restricted and the workshop filled up quickly. Organizers: Deb Agarwal (daagarwal@lbl.gov), David Skinner (deskinner@lbl.gov), and Eric Pouyoul (epouyoul@lbl.gov). The recent "Conference on Data Analysis: Exploring Research across the Department of Energy", featured Deb Agarwal as a keynote speaker on the topic "Changing Your Perspective from Serving the Data to Enabling Data Users." Taghrid Samak and Arthur Weidmer were also featured at the conference as invited poster presenters. The ACS team involved in the work includes Deb Agarwal, Monte Goode, Keith Jackson, and Gary Kushner. They collaborated closely with BWC personnel, Marty Humphrey and Norm Beekwilder of University of Virginia, and Catharine van Ingen of Microsoft Research on these projects. It is rare to submit three papers to the same conference, but even rarer to have all of them accepted! But this is exactly what happened in the summer of 2011 when two summer students, Zach Fadika and Elif Dede, had all three of their submitted papers accepted at the Grid2011 conference held in Lyon, France. Elif Dede was advised by Dan Gunter and Lavanya Ramakrishnan from ACS, and Zach Fadika was also advised by Lavanya Ramakrishnan with Shane Canon from NERSC. We look forward to hearing many more good things from Zach and Elif (and, indeed, all our summer students) in the future. Mathematical models intended for computational simulation of complex real-world processes are a crucial ingredient in virtually every aspect of DOE science. Utilization of such computer models requires addressing Uncertainty Quantification (UQ), a greatly expanding field focusing on systematic uncertainties in computer models such as model limitations, sparse inputs, and initial conditions; and statistical uncertainties such as noisy or incomplete data. Within LBNL and CRD in particular, there is an excellent mix of skills in mathematics, modeling, parallel programming, and systems to address these challenges head-on. But current CRD approaches to understanding and using UQ are scattered across researchers and departments. To help better focus CRD efforts, Dan Gunter and Lavanya Ramakrishnan of the Advanced Computing for Science (ACS) Department formed an Uncertainty Quantification Study Group that will help familiarize participants with the varied aspects of the UQ challenge, and spur discussions of how CRD research can be applied to their solution. The study group is an opportunity to cross-germinate ideas and explore collaborations across groups. Read more on the UQ group wiki..
Exascale computing and cloud computing are both rapidly emerging as key capabilities available to support scientific computation. The forecast for many aspects of computing definitely calls for exascale computing or clouds, but cutting through the hype and getting a clear picture on the possibilities and limitations of each requires a deep look into the technologies and intensive hands-on sessions. To this end, Berkeley Lab's Computational Research Division (CRD) and NERSC hosted a weeklong workshop on cloud computing from June 20-24 and a half-week workshop on high-performance computing advances June 15-17. The Center for Information Technology Research in the Interest of Society (CITRIS)at UC Berkeley helped host the workshop. Participating organizations helping Berkeley Lab provide content include UC Berkeley, Google, Yahoo!, Amazon, Cloudera, the and Microsoft. The Department of Energy's National Energy Research Scientific Computing Center (NERSC) contributed workshop content. Participation was limited and the limit was quickly met. "There is a lot of information floating around on exa-scale and cloud computing, but it's not easy to separate fact from fiction. Fortunately, we have a number of research projects, testbeds and collaborations working in these areas, so we were in a good position to marshal the necessary resources for this workshop," said organizer Keith Jackson, of CRD's Advanced Computing for Science Department. This month Amazon Web Services (AWS) lauched a new Cluster Compute Instances offering for Amazon EC2, which will make high-bandwidth, low-latency HPC resources available in a cloud-computing environment. 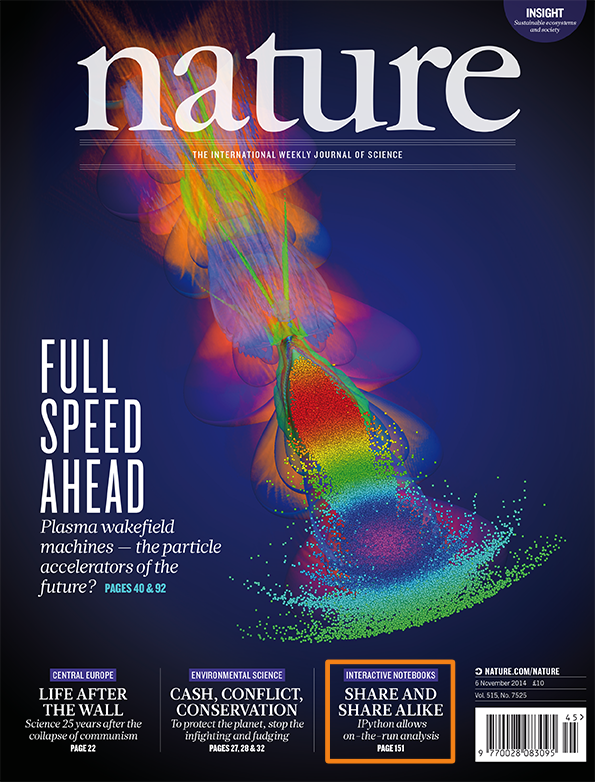 To ensure that this new service can handle a gamut of demanding HPC applications, AWS staff worked closely with researchers in the Berkeley Lab's Computational Research Division (CRD), Information Technologies Division, and NERSC. read more..